The Tignes Chalet Company Blog - Chalet Accommodation Tignes: We're getting ready for the new season, are you? With the Espace Killy set to open in less than two months most are thinking about organising their trip for next season and getting in tip top shape to make the most of their time on the hill. For those budding ski instructors and ski racers the focus has probably switched to preparing themselves physically (and maybe mentally) for the season ahead. The physical side of the sport is very important for those instructors looking to make the grade at the notoriously difficult 'eurotest' or 'test tecnhique' races in addition to the technical skiing exams- for those of you not 'in the know' to work in France instructors are required to achieve a certain time which varies from race to race (usually within 10% of a current or ex-professional ski racer) in order to apply their trade in France and complete the Level 4 ISTD qualification.. It is still good practice to keep yourself fit for skiing, as a regular holiday skier or even if you've achieved the euro-test or test-technique pass along with passing the other exams, especially as an instructor working day to day in the mountains. Naturally, our backroom staff here at the Tignes Chalet Company consists of ski instructors and winter sports enthusiasts alike. 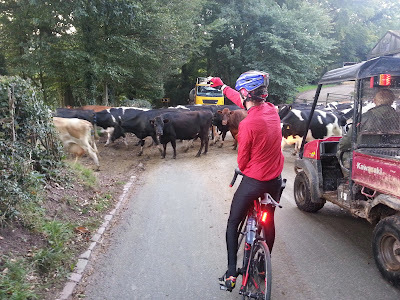 We are all keen athletes/sportsman, so what are we doing to get fit for the mountains? Do these cows not know we're in training?! Cycling is the obvious choice! With attributes such as lower leg strength similar to those required for skiing this can be a perfect activity to get you into shape for the mountains. 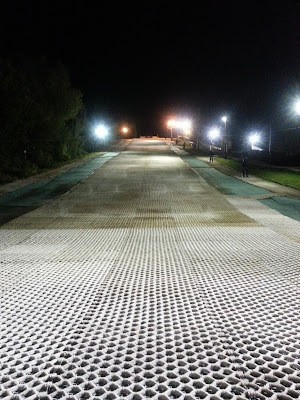 The main slope at Stoke Ski Centre (Festival Park, Staffordshire) earlier this week. However, dry slope skiing can be beneficial to your technique and if you can get the fundamentals right on the plastic this can only help when you're out in the mountains. It's also a less expensive option to the notoriously overpriced indoor snow centres across the land. Of course if you like to keep you skiing activities strictly to the snow other activities such as running and gym work can also be beneficial to your skiing fitness. It doesn't matter how you achieve your skiing fitness as long as your in prime condition to enjoy the mountains!